Remote work ranks up there with one of the coolest perks a company offers. Who wouldn’t want to trade a workspace in a noisy open office for a hammock on the north shore of Hawai’i? Plus, with inter-office communication tools like Slack and Google Hangouts and project-management programs like Trello, it’s never been easier for employees to work outside the main hive. But making remote work successful requires effort on both sides. The company has to trust its employees are putting in the same amount of work as they would in the main HQ. The remote worker needs the assurance that their decision to work outside the office won’t affect their standing or be judged against them. Being “out of sight and out of mind” is the biggest challenge that remote workers have to overcome. Overcommunicating, as explained above, is crucial for keeping up with an ongoing workflow – but even more important than that is the need to demonstrate your impact. Someone working next to your boss will always have an advantage in that they’re more visibly present, so you have to overcompensate a bit (which can be a challenge for introverts). Properly structuring your workday is critical to being a successful remote worker. It can be easy to get distracted and spend two hours watching Star Wars trailers on YouTube when you’re working solo. Linda Jonas, our Director of Brand and Community, recommends creating a dedicated space for work, whether in your home, in a cafe, or at a coworking space, so you can have a physical designation that it’s time to focus. The theory goes that a remote working culture is more beneficial for introverts, particularly those who feel more creative working in solitary environments and perhaps struggle to focus in open offices. Many of our remote employees consider themselves extroverts, though, and have found as much joy and productivity in working remotely, despite the lack of day-to-day contact with their coworkers. Sarah Burgess, who works in Customer Support, notes that she can feel over-stimulated in office environments. So she likes having the option to detach and maintain communication with coworkers virtually – along with the flexibility of being able to work remotely from places like Silicon Valley or New Orleans. Scott, on the other hand, will take his work to a nearby cafe for a change of scenery, or hop into his 4G-equipped Westfalia van and work from the beach. 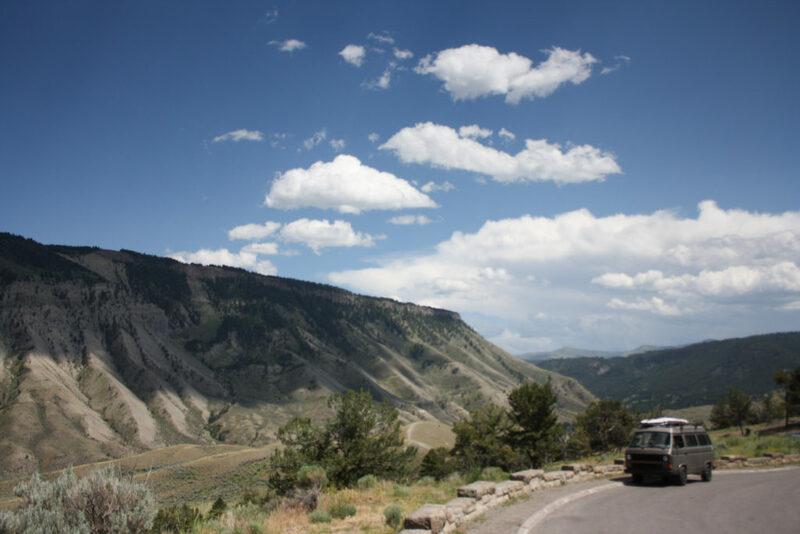 Scott Faverty’s Westfalia van during a remote-working trip to Yellowstone National Park in Wyoming, USA. At some companies, remote workers must agree to a number of performance-tracking measures to ensure productivity, be it screen monitoring, keyboard/mouse tracking, etc. At Small Improvements, we don’t believe in checking up on people’s work, but instead, trust that they’re responsible and delivering on what their role requires. A culture of regular 1:1 meetings helps ensure that managers and employees are in the loop on current progress. Like it or not, employees who work remotely need to tailor their schedule around the office. Our West Coast employees, for example, wake up early on Tuesdays to join in our company All-Hands to compensate for the nine-hour time difference with Berlin (5 pm for us, 8 am for them). Or it could mean the occasional late night for someone working out of Sydney. Remote workers suffer one distinct disadvantage – little-to-no connection of the office culture. For some, it’s a pleasure to come to the office and grab some fresh fruit and a cafe latte before starting work. For others, it’s those conversations around the proverbial water cooler that are essential to unlocking mind blocks and solving problems. It also means missing out on things like office celebrations, parties, and Lunch-n-Learns. Olga Oulie, who heads up our People Department, has worked to integrate our remote workers into the Small Improvements’ culture. In addition to the annual four-week Berlin trip that everyone can sign up for, remote workers routinely receive small, Berlin-inspired goodie bags for their birthdays and are sent Polaroids from office events. “It’s simple. Everything that we do here, we should celebrate there as well,” Olga says. At Small Improvements, our US team has been remote right from the start, and we have long encouraged all employees to work wherever they desire for a couple of weeks a year. We’ve had developers fix bugs from locales like Laos, South Africa, and Italy. Customer Success has provided demos for potential SI users on the beach in Carmel, Calif. Linda went completely nomadic and has worked remotely for the last two years.